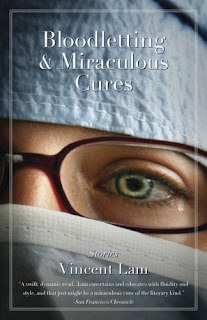 Bloodletting and Miraculous Cures by Vincent Lam was the recipient of the 2006 Scotiabank Giller Prize, an amazing accomplishment considering it's this Ontario doctor's fiction debut. It is a collection of interconnected short stories that read very much like a novel. Ming, Fitz, Chen and Sri are medical school students coping with family expectations, the worries of admission, the pressures of medical school and the intensity of the emergency room. It's difficult to classify these short stories. Really, there is a bit of everything. There are stories about human relationships and the difficulty forging and maintaining them while engaged in such high pressure work. There is a bit of a thriller with the story of the paranoid patient and the doctor who becomes unsure of his own reality. It is an adventure story with the air rescue of a dangerously ill tourist. Throughout it all there is humour laced with sadness and exhaustion. On the surface it would seem that medicine and fiction writing would not be a great combination. Both take considerable time. On the other hand emergency room physicians can have very personal encounters with strangers who will tell them things they would never tell another soul. Surely the ideal situation to gain keen insight into human nature. Anton Chekhov , considered to be one of the world's best short story writers, qualified to be doctor in 1884 and treated the poor for free earning money from his writing. Arthur Conan Doyle, a one-time ship's doctor and a private practitioner of lesser success, began writing short stories in-between patient visits. Later in life he set up as an ophthalmologist in London. In more modern times there is Jed Mercurio who has created medical television dramas for the BBC, but whose fiction, so far, is not medically themed. Kevin Patterson is another Canadian doctor has written about tuberculosis patients in Canada's arctic. Abraham Verghese is an Ethiopian doctor, currently at Stanford University's School of Medicine. Verghese, like Sri of Bloodletting and Miraculous Cures, is a compassionate man who always bears the patients' suffering in mind. His latest book Cutting for Stone is a family saga set in India, Ethiopia and the United States concerning a family of doctors and one son's quest for find his missing father and resolve their troubled past.